Written by wouter on Dec 12 2018, 09:59 in CommonsCloud Blog. Written by joseplluisat on Oct 26 2018, 11:57 in CommonsCloud Blog. 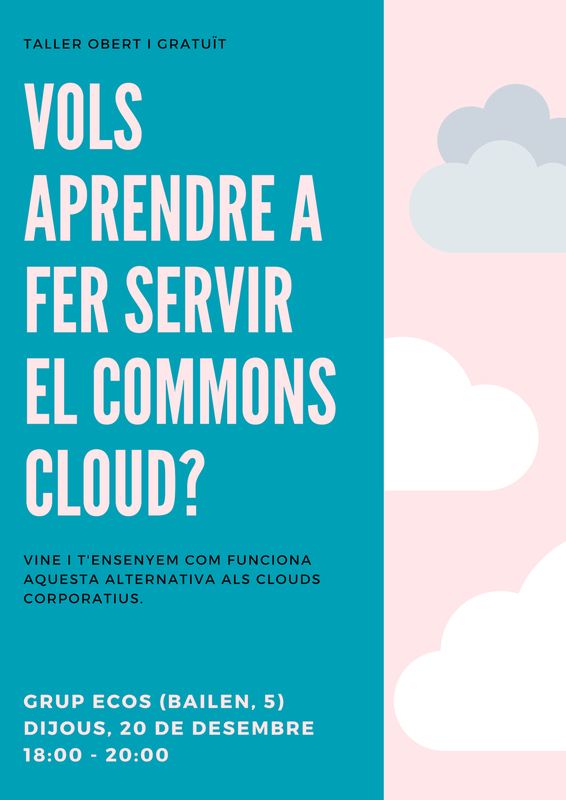 Tens alguna altra idea amb la que podries col·laborar en la plataforma CommonsCloud? Explica'ns com i gaudeix del nostre servei de forma gratuïta durant 1 any. Estarem a la FESC, a la taula 74 a la part tecnoFESC. Parlem? Written by wouter on Oct 16 2018, 07:20 in CommonsCloud Blog. Com sabeu, CommonsCloud va neixer amb una vocació de donar un servei de plataforma col·laboratiu i cooperatiu per guanyar autonomia de les grans plataformes que es diuen «gratuites» però no ho son. Es queden amb la teva vida. Si volem tenir vida pròpia en el futur, ens hem d’espavilar i ràpid. 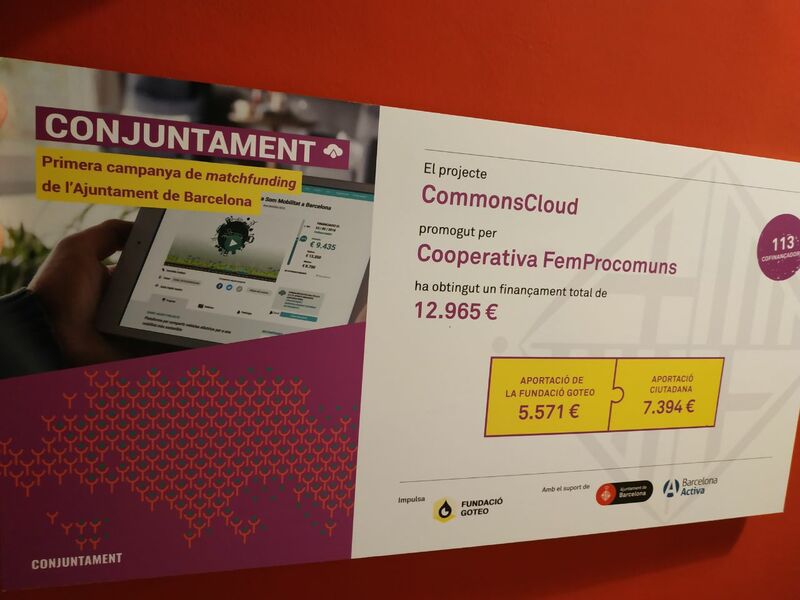 Per això vem construir aquesta aliança amb actualment deu entitats compromeses amb la Soburania Tecnologica i per impulsar juntes aquest cloud cooperatiu. Participar a Goteo Conjuntament va ser un plaer i un honor. Ens vem marcar a una recaptació mínima de 6000 euro. La campanya ens va permetre tenir 113 cofinançadores, persones i entitats que juntes van aportar gairebé 13 mil euro! Written by wouter on Oct 16 2018, 07:02 in CommonsCloud Blog. Written by wouter on Mar 10 2018, 09:30 in CommonsCloud Blog. CommonsCloud is an online collaborative platform, an alternative to proprietary software platforms like Google Drive, but respectful with privacy and it doesn't commercialise your data. The ambition of the CommonsCloud project is to offer an alternative to proprietary cloud platforms, under the control of its users, replicable as free software and well documented. This is collaborative web applications to edit, store and share documents, agendas, manage projects and facilitate debate and decision-making. The way we do this is through an alliance of collectives committed to free software and digital sovereignty, building on the best web applications that are already out there and bring them together in a user-friendly environment where people help each other, enhance their awareness regarding the power of self-governance and sovereignty.